That low, rumbling, squelching sound you’re sensing at the edge of your hearing is nothing to be alarmed by; it’s just the collective peoples of the internet simultaneously excitement-soiling their pants because a new trailer for the next Star Wars movie has been released. 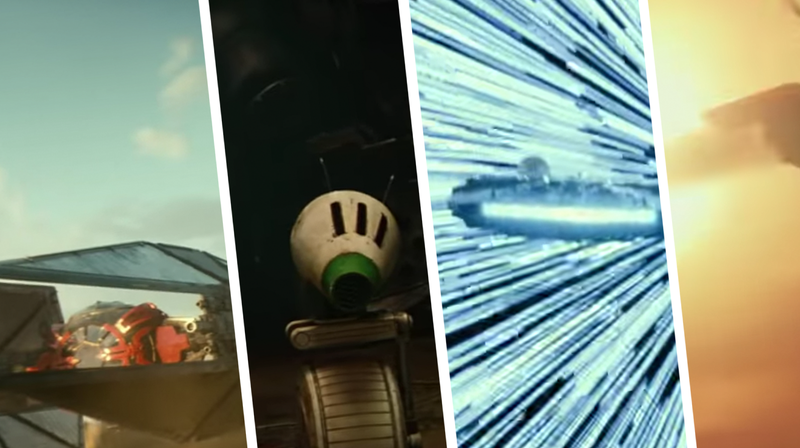 As is required by the Jalopnik by-laws, I will now scrutinize the trailer for information about droids and spaceships and other vehicles or robots. It looks like we have some new things to talk about! It looks like it comes up to C-3P0's knee joint there, making it somewhere around, oh, 15 to 17 inches high, or so? I suspect that the green-bezel’d object at the cone’s apex is some sort of optical sensor, with the three slots on the upper surface of the head perhaps holding additional environmental sensors. The pair of antennae on the head I suppose are used for some manner of wireless communication. There must be some droid standard for this stuff, as BB-8 has a couple antennae himself. 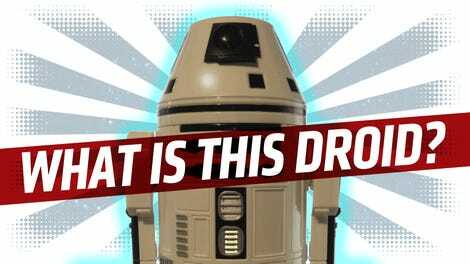 The question is, what does this droid do, other than continue the smaller/cuter evolutionary trend we’ve been seeing in non-humanoid droids in the Star Wars universe? Based on the small size, I don’t think this is another sort of astromech robot like the R- series or BB-8, as those droids require a large variety of tools and arms to accomplish their many and varied jobs. Droids like R2-D2 have a barrel-shaped body with plenty of room for these tools, and BB-8's spherical body also provides space for appendages, as we’ve seen. Since the shape of this new droid’s head reminds me of those old Mad Magazine Spy vs. Spy characters, I’m going to call this an SVS droid, because why not. It’s possible there could be some room inside that wheel for arms or tools or other components, which could also explain why it only has a support arm on one side—maybe the other side needs to be free to have panels that open? It sort of reminds me of those annoyingly slapsticky Pit Droids from the prequel movies, at least in scale, but it doesn’t really seem like a repair droid. Maybe it’s for communications and networking, or something? Surveillance? I guess we’ll find out. Perhaps an olfactory sensor? Does it cook? 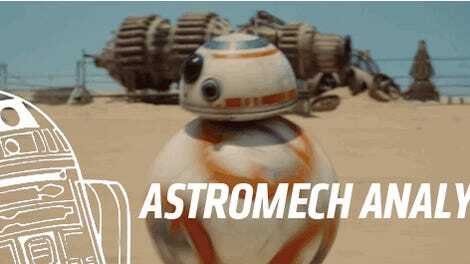 The droid was said to be based on the look of a duck, and it will be pals with BB-8. The purpose of the droid has yet to be revealed, though. A working physical one has been built, and has shown up to fan events. Good to know! That’s the only really new droid in the trailer, so let’s move on to spaceships. I believe the TIE-variant we see Rey attempting to fight, all by herself, is new, as it has the elongated and bifurcated “wings” of the TIE Silencer Kylo Ren flew in The Last Jedi, but the main spherical central body is very different. Where the TIE Silencer had a very sleek, sinister central module, this one appears to be ruggedized and cladded in that orange armor plating or whatever that is. It looks less sleek and fast, but much better suited for nearly scraping along the desert surface like it’s doing in the trailer. It looks, you know, trail-rated, or like a TIE with the X-Treem Overlanding package. I’m assuming adjusting the seat heater or changing the radio station. From what I can tell in the picture of it going to lightspeed above there, it looks like that antenna has once again been replaced with a round one. Make up your mind, people! Based on the wet-looking climate and the lack of Ewoks, I’m guessing this may be the wreckage of the first Death Star on Yavin 4? I wonder if they have a commemorative plaque or a gift shop around there anywhere. I suspect we’ll be seeing more ships, more droids, more everything in the coming months, and I’ll do my best to evaluate and scrutinize it until you want to puke.